Last weekend Carlie and her AHG (American Heritage Girls) troop had an evening at their troop leaders home to work on a badge requirement that they girls wanted to attain. Cake decorating! A FUN badge!!! The younger girls went to one house and the older girls went to another. I wish I had a picture of the younger girls work. It was a super cute ladybug. There was a baker who came to the workshop for the older girls and she talked about what it was like to bake for a living. She showed the girls how to decorate with piping and to make little flowers. 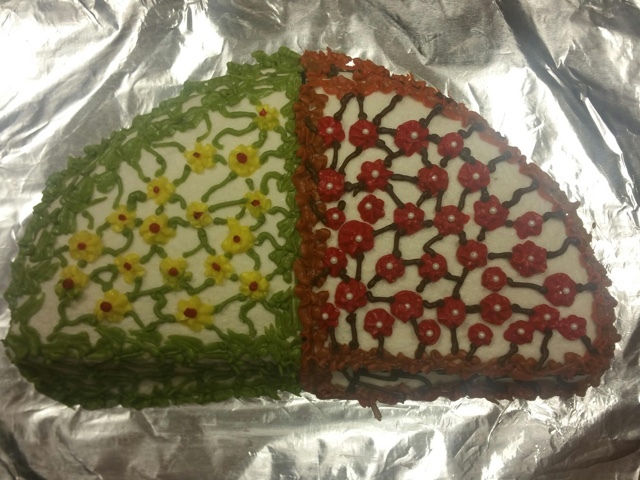 Here's the cake they made, in the picture below. 2 layers, pretty little flowers and vines. When Carlie got home, she told me that she wanted to make a batch of cupcakes for Dade Days, that some of the older girls were wanting to make some as well. 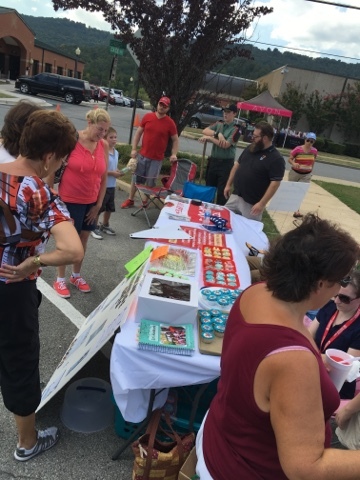 We had a full plate for the day anyhow, and I wasn't keen to add more to it, but she was adamant... She had her heart set on making cupcakes to take and sell to help raise funds for her troop. I asked her about what she wanted. 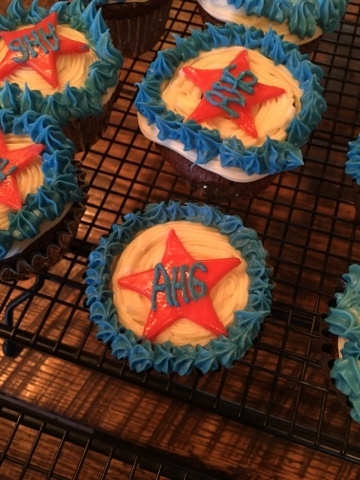 She told me that she wanted a chocolate cupcake, with a star in the middle and AHG on the star and it to be red, white, and blue, the AHG colors. She was VERY specific and knew exactly what she wanted and it was just Mom that needed to help her accomplish it because we were out of cupcake liners! Ack!!! Now I don't know about you... but I just had to brush off the tiredness because my little girl was determined and had a plan... I HAD to help. We got the supplies, we laid everything out. We got the cupcakes in the oven. We mixed up the colors and I had to figure out the star. She was thinking we could pipe it, but I knew just how hard that would be to make them look uniform and somewhat professional. I had bought a bag of 'Starburst' candy. We rolled out the reds and used a small star shaped cookie cutter to cut them out. 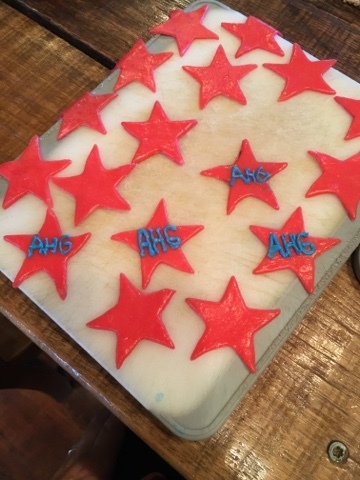 Then with a small writing tip and blue icing, we wrote AHG on the stars. It worked very well! She decided she wanted to pipe a border on the cupcakes also, because they looked a little bit bare. She piped out the white, added the star, and then a star border and there you go! An adorable cupcake designed and made by my girl. 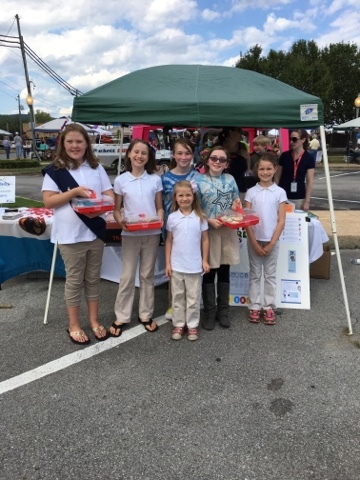 A picture of just some of the girls selling their wares. Little cuties. 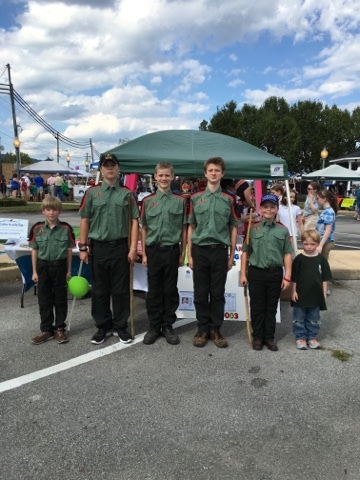 And a picture of just some of our Trail Men who we shared the booth with. They were handing out flyers and brochures about the group. 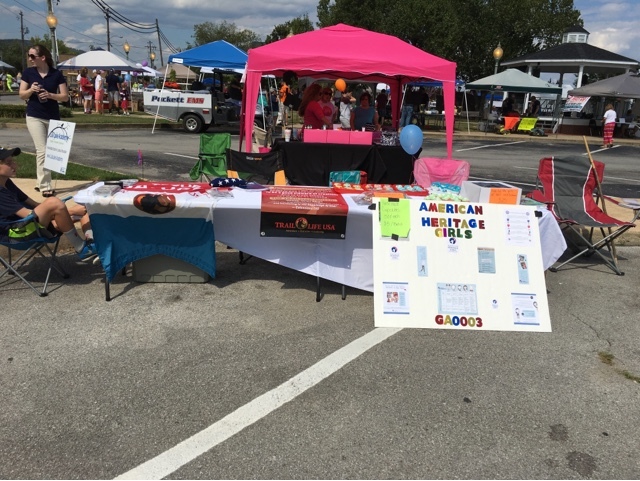 It was a fun afternoon, I tried helping the girls get out of their comfort zone by walking around with them and selling their cupcakes rather than just staying at the booth. Shannon helped pass out brochures with the boys. It was a new adventure... we learned some things, we did some things right, we did some things wrong, and we are excited about what we can do next time. Learning and developing new skills... Both of these are great things to accomplish.